Great signs! 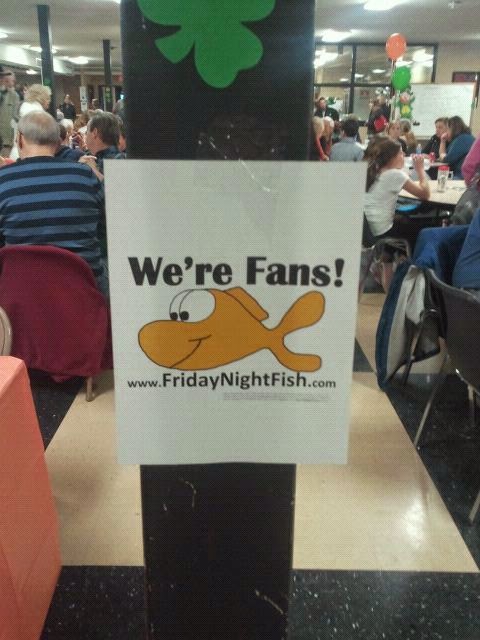 Any fish fry that puts up Friday Night Fish "We're Fans" signs automatically gets a 4 start rating for wayfinding. Big sign up on second street. Ordering was clear and easy and there was only a short wait at 5:45pm. You order and then they call your order when it's ready. No visible recycling. Styrofoam plates. Excellent Cod and walleye. Probably gives St. Henry's in Belleville a run for its money in terms of the Cod. The walleye was an special treat. It was a huge serving and fried perfectly. Sides were for the most part the standard fish fry fare - fries, cole slaw, hush puppies, green beans, onion rings, and spaghetti. However, the stewed tomatoes were another special treat. I'm not sure what was the special flavoring, but the tomatoes were great. The slaw was also well done. Good selection of desserts. The other entrees included fish tacos and fried shrimp. We didn't try the fish tacos, but we heard good reviews. OK value. Since they only have the fish fry once a year, I assume they are trying to maximize fundraising, so dessert and drinks were extra. $34 for our family of five before drinks and dessert. 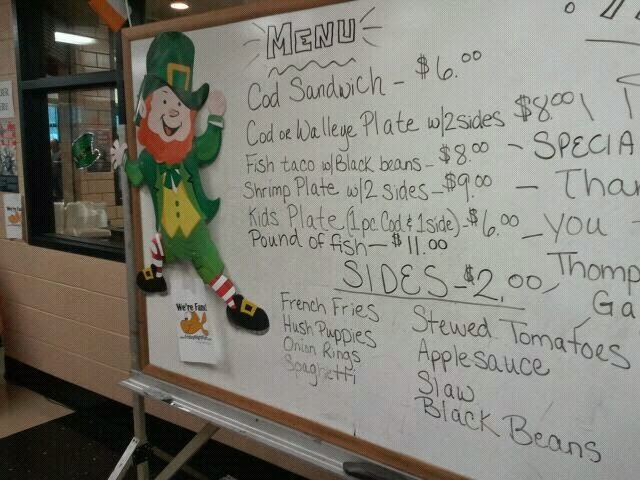 Cod, walleye, or fish taco plates were $8, shrimp plate was $9. Kids plates were $6. Extra sides were $2. Soda and bottled water were $1, beer by the glass $2, pitcher was $7. Dessert was $1. Great atmosphere (did we mention all the great "We're Fans" signs decorating the cafeteria). Full cafeteria with a loud din of conversation. Round tables and full size chairs. Students were quick to come by your table to take trays and empty plates. Plus with the slight wait from ordering your food to getting your food, they passed out little trays of popcorn as an appetizer. Great Illinois fish fry - it was terrific - or should we say 'walleyerific'. St. Henry's had made our list before for best Cod, and the Cathedral school ranks right up there. The Cod was excellent. However, the walleye may have been even a little better. Both were good size servings and fresh out of the fryer. Everything a good fish fry should be: great volunteers, delicious food, and a great atmosphere. 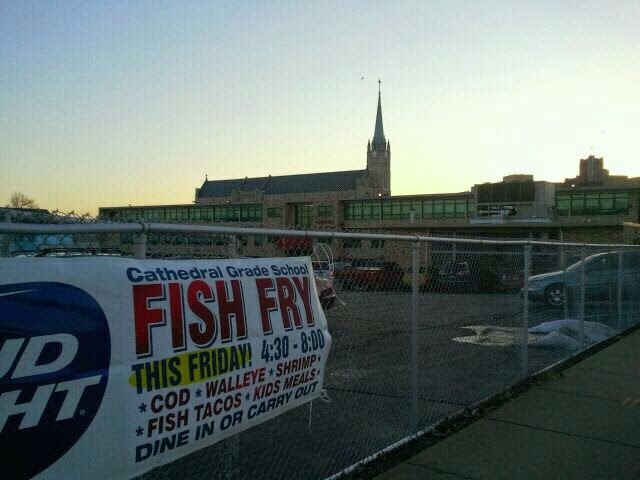 Cathedral School only has one fish fry a year, so be sure to check their schedule before you go, but it is worth checking out. Plus its just a few blocks from beautiful downtown Belleville which you should check out before or after you go to the fish fry.